We can only stop Brexit with a huge collective effort. 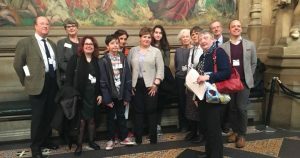 As the Brexit negotiations and legislation reach a critical stage, Islington in Europe is aiming for a big push to shift opinion among MPs and the general public. Write to your MP. Not just once, write as often as you can. More letters means more impact. Use email or, is possible, snail-mail probably has more effect. Talk to your MP. Phone their office or visit their surgery. If you don’t get to speak to the MP personally, make your case to their assistant, again and again. Get active on social media. Engage with people who still don’t have a settled view on Brexit, but also share your efforts with fellow campaigners. Tag @IslingtonIn in your tweets. Write to the local and national papers and get your voice heard on phone-in programmes. 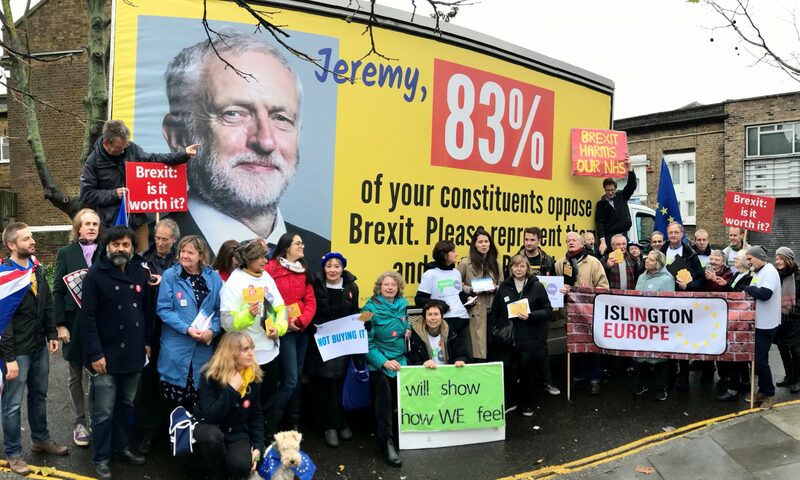 Attend Islington In Europe’s local street activities and help swell the numbers attending the big national and regional marches and rallies (see future events). Encourage friends to get active, in particular if they’re in a part of the country where the MP has a narrow majority (see target constituencies). Need some help writing to your MP? 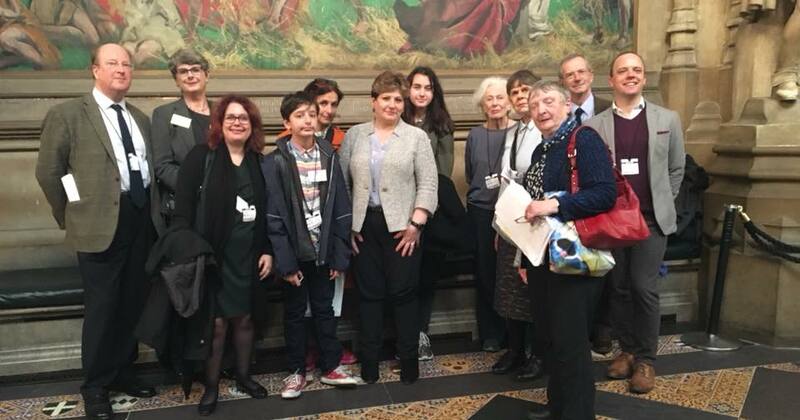 We are starting a writing campaign called Islington Writes to target Jeremy Corbyn and Emily Thornberry in the run up to the parliamentary vote on the final Brexit deal. This is our one big chance to have a real effect on the outcome. Labour is KEY for this vote, and of course our MPs in Islington are particularly important in forming Labour’s position. Don’t give in to what seems to be inevitable. Can you help us by writing the occasional letter, email or tweet? The letters you write will be a strong public voice, so our MPs know their constituents feel strongly about the Brexit deal vote and their voices cannot be ignored. Each Tuesday we will email the week’s rota for MP letter writing, so each person should only need to write once every few weeks. The idea is to maintain a steady stream of letters through to the vote in the autumn. We have made the writing club as easy as possible to join by asking for only a small time commitment, of perhaps 30 minutes a month, making the club flexible so that you can change/postpone as you need to and by being available to help with letter templates or any questions you may have. Contact IslingtonWrites@gmail.com to get involved. Both Jeremy Corbyn and Emily Thornberry, like all MPs, hold regular drop-in sessions at their constituency surgeries. We need a string of volunteers to go along – one or two people each time – to try and speak to them about Brexit. If you can put to them a real human story about the negative impacts of Brexit, so much the better. Can you spare maybe an hour a month to go along, and hopefully speak to Emily or Jeremy themselves, or if not them their assistants? We’ll supply you with all the necessary details. Contact johnandfernanderson@hotmail.co.uk to get involved. 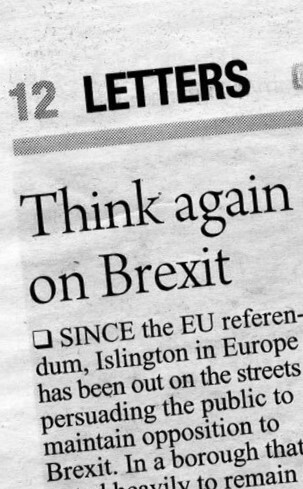 Letters pages – whether in local or national newspapers – always attract a high readership. We need to make opposition to a hard Brexit the normal currency. And for that we need to generate a stream of correspondence. But the impact is less if it’s just the same letter-writer each time. 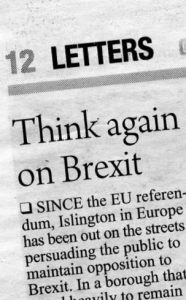 We’re particularly keen to maintain a voice in the letters pages of the Islington Tribune and the Islington Gazette. Can you lend your name – you don’t need to have your address published – to a letter or two? We can supply drafts if you’re stuck for inspiration, and email addresses for the different newspapers. Contact lasoks@btinternet.com to get involved. Have you been maddened by the sort of Brexit lies or invective you regularly hear on ‘phone-ins and the like? We must counter the constant drip-feed from Brexit zealots that forms background listening for so many people across the land every day. Could you pick up the phone – or tweet – to remind listeners there’s another point of view? Even just once – or more often if it takes your fancy! We have compiled a list of contact details to make it easy for you. You have friends all over the country who are desperate about Brexit. But not all of them are in contact with local groups that give opportunities to do something practical. Share our ideas with them! It’s particularly important to mobilise dormant supporters in constituencies where the MP has a narrow majority and is vulnerable to pressure on Brexit. Look at our Target constituencies, see if you know people in any of those locations, and encourage them to get active!